At a recent national conference of law enforcement instructors, the topic of baton use surfaced at one of the presentations. The instructor asked the audience if any of them, as instructors, had used a baton against an aggressor or assailant within the past year. To be fair, many of those instructors were currently on assignment at their respective academies and not on the streets, and thus would not have had the opportunity to use force. But of those who were street warriors, the answer was, astoundingly, zero. The instructor then asked these instructors, who should have their fingers on the pulse of use-of-force incidents in their respective departments, to comment on the frequency of baton use in general. Now, there were some small departments represented in that group, but most were midsize and large agencies, and these instructors struggled to remember the last time a baton was used to strike and subdue a suspect. One trainer said he was from a 300-officer department and the baton was used only once to strike in the past year. In my sphere of influence, I continue this poll with the agencies I train and network, and I've found the above results are the norm rather than the exception. To complicate matters, in agencies where baton use exists, and in court cases in which I've been retained as an expert witness, I've discovered numerous baton failures, primarily not in product, but in application. Maybe I just missed the agencies where baton use is frequent and universally successful, but I suspect not. Media exploitation of officers who justifiably use the baton. Many of the above factors underlie decreasing baton usage. Certainly, the criminal element is not growing lax in their approach to resisting and fighting with the police. Regardless, I am a proponent of the police baton for numerous reasons. First, it's the link between empty hands and deadly force; in other words, officers don't have to put it away to deploy another piece of equipment to escalate or de-escalate force, and no other piece of equipment on your duty belt offers this multiuse capacity. It stops some fights before they start because people believe they will get hit if they don't comply, and a baton is affordable and its use easy to train. Call me a traditionalist, but it just still seems to fit the police profile. Probably most important, however, the baton can end a confrontation fast without excessive injury to the officer or the suspect, and since confrontation ends quickly, the likelihood of prolonged confrontation and excessive repetition, a major element in custody death, is minimized. Finally, fellow officers seem more anxious to help stabilize a subject downed via baton than they do when the threat of 50,000 volts is present. Now let's discuss what technology exists on the market today, how agencies and officers should choose from all the options and take a look at the three major players currently on the market. We have traded the long wooden baton of the past for a more convenient product, the expandable baton. Consequently, we have traded size and mass, ease of deployment and simplicity for the convenience and assured presence of today's expandables. Deployment, though, is an issue with expandables, and I will discuss that below. Before you decide to embrace or abandon the baton, consider the technology currently available and its potential for controlling highly resistive or assaultive subjects. Unlike the LAPD 26", second-growth hickory baton of my grandfather, the modern day expandable comes in a variety of sizes and weights. The one-size-fits-all mentality no longer applies to batons. Officers can choose a baton ranging from 16"-31" long, depending on their duty assignment, stature strengths and weaknesses. Officers can color-coordinate with high-profile silver, nickel or chrome batons, tactical black batons or even gold batons, and choose from an assortment of grip textures. Comparing current baton technology is similar to attempting to compare current firearms and ammunition/ballistics. The age-old debate over the best caliber for law enforcement continues, but in the end, officers must perform a personal task analysis based upon many personal variables. Do you want one-hit stopping power, multiple-strike capacity, quick reload, big, small, etc.? You also must answer the question, "Can I handle what I want?" Once again, the answer revolves around personal variables and necessities. Like gun and ammo manufacturers, baton manufacturers will argue all day about the capabilities of their product(s), but the fact remains all products offer advantages and disadvantages when it comes to individual operators. Bottom line: Operators must make the best possible decision when choosing a tool upon which they may stake their lives. Final judgment must be based on officer size, strength, training, experience and assignment. A baton is not an option if it's impossible or too difficult to deploy, and, of course, no baton strike will work when delivered weakly or ineptly. Also, without the right attitude behind the strike, failure is predictable. But although any baton in the hands of a skilled and fit operator should suffice, "skilled" and "fit" are subjective, and officer experience varies, so a more objective guideline for choosing a baton must exist. Start by considering your duty assignment. If you need to conceal the baton due to a plainclothes or detective assignment, go with a shorter length. This compromises baton weight, but the element of surprise as you dramatically extend the baton can morph you from a seemingly nondescript citizen to a warrior and have a very debilitating effect on an aggressor. Speed, shock and overwhelming action are sometimes more important than the size or weight of the stick. As an instructor, I've done demonstrations that prove this by using a foam training baton, and if I can do it with foam, you certainly can do it with steel. Non-uniformed officers must, therefore, practice so they become fearsome in deployment and presentation. Uniformed officers usually choose a baton in the 21"-26" range depending on their own size and whether they stand and walk or sit and drive the majority of the time. Longer models on shorter officers usually result in a baton poking the ribs; although a rotational holster helps some, with all the equipment on duty belts these days even the rotation may not help. An officer on a foot beat can deal with the extra length without compromising comfort. Many perceive a baton's length as an advantage because it can extend your distance from an encounter or subject. But, as Tony Blauer of the SPEAR close-combat system likes to say, "All police fights happen within the confines and space of a telephone booth." Therefore, the extra-length security blanket may not actually exist unless maximum forewarning of conflict occurs. In fact, a long baton could prove cumbersome to handle in close battle. Carefully assess the probability of a spontaneous attack versus a pre-announced event, and you may decide length is for show and compactness and efficiency are for "go." ASP Inc.'s baton was the pioneer on the American law enforcement expandable baton scene, and it hasn't changed much since its introduction. Cosmetics and aftermarket add-ons are now available for the ASP, but its basic design remains unaltered. The ASP baton ranges from 16"-31" long, and officers can adapt it to any duty assignment, including uniform patrol, mounted units, plainclothes, detective assignments and administrative positions. Essentially, the ASP is a friction-lock device that requires manual downward or upward opening (as do all expandable batons; that is, none are spring loaded). You can't open it by grasping the end or tip of the baton and pulling it open. It requires manual closing (as do most). The ASP is the lightweight of all the batons, and I don't mean that in a derogatory sense. It features the least amount of forward mass, weight and weight transfer, but it provides an edge on reload speed and multiple-strike capacity. A successful deployment requires accuracy, precision and speed-padded body areas may require multiple hits-but this baton is up to that task. Think of it as the 9mm of batons, to return to the firearms/ballistic analogy. For testing purposes for this article, I received a 21" ASP baton, a 26" ASP baton and ASP's Tactical Defender, which consisted of a 16" Airweight baton coupled with a pepper spray dispersion unit. This baton is not recommended for uniform duty use, but would be great for off-duty use, especially with the OC component. These ASPs came with plastic rotating side-break holsters, which I view as the most dramatic improvement in ASP's technology. This holster allows quick deployment, but its side-break feature may no longer be necessary and may compromise weapon retention somewhat. Previous ASP holsters made the ASP baton a secondary tool-quick draw was impossible out of nylon or leather rigs, especially in an upright carry format. Many officers found that for rapid deployment, they had to locate this previous baton holder behind the firearm, an undesirable location for any tool in the warrior arsenal, because combat requires frontal placement of all primary weapons. This new rotating holster allows a return to conventional placement, usually on the non-handgun side of the duty belt, making reaction-hand deployment as well as cross-draw possible. The models I received incorporate a textured grip, which I recommend, and feature the usual quality for which ASP is noted. A foam-like "federal" grip is also available, but this type of grip can slow the drawing process, especially from a leather- or nylon-type holster. The ASP is manufactured of 4140 steel and reportedly will withstand more than 9,000 lbs. of stress, which should be plenty for duty use. I have used an ASP in training and on the street, and it has remained functional. I actually own an ASP baton older than some of you readers, and it works as if it just came out of the box. These batons will serve you well. Monadnock Lifetime Products, Inc. has also been around for a long time, and the Monadnock expandable batons furnished to me seem extremely well made. They are formidable striking instruments, thanks to the 4-oz. weighted tip that puts more mass into the strike and ensures more penetration. I recently viewed the Monadnock 22" baton in action by a friend who is a Las Vegas-area officer. One strike literally picked the assailant off his feet; in a matter of seconds, the subject was down on the ground holding his leg. This incident not only emphasized the importance of proper baton placement and positioning, but also proper targeting and the blending of the tip advantage with power development. The tip does not extend the entire length of the distal shaft; therefore, it does not forward-weight the baton to the extent that centrifugal force might pull the baton out of a user's hand. The balance of this instrument ensures the conversion of centrifugal force to centripetal force, essential for the production of kinetic energy. I received numerous models, including the 22" and 26" batons. Think of these batons as the .40 caliber of batons. They provide more forward weight and more potential for weight transfer than the ASP batons, without compromising reload possibility. Monadnock invented the rotational holster and coupled it with a plastic material that allows for swift deployment. The holster also includes two security features that prevent accidental baton loss in such situations as a foot pursuit, and allows for reholstering in emergencies or for handcuffing while expanded. The Monadnock is made of 4130 aircraft seamless alloy steel tubing. One feature distinguishes it from the baton field: its locking mechanism. Unlike its competitors, the auto-lock baton is not a friction-lock baton. It actually locks into place using a camshaft, ball-bearing locking mechanism, ensuring the baton will remain locked open while an officer delivers strikes and jabs. Unlike other batons, the shafts also rotate, enhancing weapon retention. Another plus: The Monadnock auto-lock baton closes without striking it to the ground or compromising your position. A simple press of a button sends the shafts back into the handle, without having to bend over and repetitively strike the baton on a hard surface. The baton is available in three finishes: black gun, bright nickel and black chrome. The grip of the auto-lock baton is available in foam and super-grip versions. Keep in mind that inclement weather conditions, body fluids and combat conditions might compromise retention. Monadnock thought of this in the manufacture of its grips, but any grip enhancement may slow deployment from the holster and compromise officer safety. The combination of this baton, its tip, the front draw swivel holster and the Hindi baton cap (see "End Caps," below) makes this the safest, fastest and most efficient baton package available today. PeaceKeeper International's Rapid Containment Baton (RCB) is made of 4130 CDN seamless alloy steel tubing, and it's machined rather than expanded or swaged to enhance strength. The main striking tube measures 1" in diameter, which creates a larger striking surface than the ASP or the Monadnock batons. The distal end cap is larger than those on other expandable batons to prevent puncture wounds to suspects during jab strikes. The grip tube of this baton measures approximately 1/8" larger in diameter than the competitors' batons for a more comfortable grip, especially for those with a large hand. It's a friction-lock baton, and the friction-lock surface is larger than the ASP's to prevent collapse during jab strikes. Think of this baton as the .45 caliber of batons. Maximum weight- transfer potential exists, but it may prove difficult for all but the strongest of officers to perform repeat strikes with this baton. For those looking for one-hit stopping power, however, these batons offer the most likelihood for success. The weight of the distal shaft may even assist smaller-stature officers to produce the knockdown power essential to quickly end confrontations. And, if you miss or one hit doesn't suffice, a complementary strike, such as a backhand strike, may prove easier to deliver than attempted reloads on the strong side. This, of course, requires the ability to maintain baton grip and maintain balance. From an aggressor's point of view, the RCB looks like something you don't want to be hit with; therefore, many fights may end before they begin. I received a 24" baton from PeaceKeeper and a Perma-Lock rotational baton holster. I also received PeaceKeeper's version of an end cap, which you can purchase separately. The RCB baton is also available in 21", 26" and 29" versions, and it comes in nickel and black zinc finishes. This baton is warranted for life. The rotational holster is a valuable component, but the 1/4-turn required to draw the baton from the holster can compromise a quick and efficient deployment. Unlike all other holsters, however, it locks into place, eliminating unwanted holster rotation during a confrontation. The holster also accepts the baton in the expanded mode, a good feature for quick baton replacement during a confrontation. The RCB, like the Monadnock auto-lock power safety tip baton, can be manually opened in a low profile manner by simply grasping the end or tip of the baton and pulling it open. Otherwise, opening the relatively heavy RCB is generally restricted to a downward motion in the direction of your rear foot/ankle, because this provides gravity assistance. To close this baton, strike it on a hard surface to loosen the deadlock taper and friction lock. Instead of the downward 45-degree striking motion required by ASP batons, you can hit this baton loosely on a hard surface, much like a drumstick striking a drum. Due to the weight of this baton, usually only one strike proves necessary to facilitate closing. Like the ASP baton, the RCB is not as easy to close during combat as the Monadnock auto-lock. This baton combines the essence of the old wooden baton with the convenience of the modern expandable. It's not for everybody, however, and the user must consider weight, speed of deployment and other factors that exist in a spontaneous and dynamic confrontation. At press time, Winchester Police Products is developing a new prototype baton and couldn't send me a unit for evaluation. The Winchester is another heavyweight, but in all fairness, without a unit in hand I can't fairly discuss its merits. I hope this article has enhanced your appreciation of the police baton and tempered the temptation to replace it with other, newer technology. The downside of this replacement mentality is that no new tool on today's market is as universally applicable to subject control and officer safety. The baton is still the most affordable and versatile tool on the police duty belt. I also want to make clear this article is not a complete and total comparison of the batons I have discussed. It was designed only to acquaint potential operators with some of the strong points and concerns with modern batons. 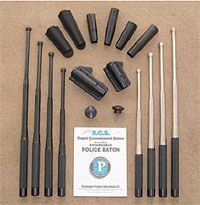 Thanks to the wide variety of modern batons currently available, all officers who want a police impact weapon can find a baton that fits their needs. However, officers considering a new baton or departments considering upgrading or returning to baton use should consult the manufacturers and seek out additional information to make a completely informed decision. Bob Willis is a full-time law enforcement instructor and trainer at Northeast Wisconsin Technical College in Green Bay, Wisc. He coordinates a multi-million dollar, state-of-the-art tactical facility devoted to realistic simulation and scenario-based training and research. He's also a sworn deputy sheriff in Brown County, Wisc., and a part-time police officer in the Milwaukee area. For over a decade, Willis co-presented the Calibre Press Street Survival seminar. For decades, he has served as an expert witness throughout America in virtually every aspect of use of force, and is a unified tactical trainer in virtually every law enforcement force technology. Law Officer magazine is published to support law enforcement by providing the best tactics, technology and training information to police officers from entry level through middle management. Visit the Law Officer Magazine Website for subscription information.